This Golden Globe darling (winner of the Best Television Series and Best Actress in a Television Series) is a vivacious and bright delight, the kind of series that will trigger a binge and bear up under repeat watching. As Lewis Carroll’s Alice so aptly points out, “What is the use of a book…without pictures or conversations?” Welcome to Readers’ Advisory (RA) Crossroads, where books, movies, music, and other media converge and whole-collection RA service goes where it may. In this column a funny woman leads me down a winding path. The Marvelous Mrs. Maisel. Amazon. 2017. Streaming. This Golden Globe darling (winner of the Best Television Series and Best Actress in a Television Series) is a vivacious and bright delight, the kind of series that will trigger a binge and bear up under repeat watching. Set in the late 1950s, it combines a captivating story—of triumph in the face of heartbreak, finding one’s footing, and learning a craft—with a wonderfully detailed landscape of Manhattan’s Upper West Side apartments, glorious outfits, and the seedy comedy clubs of Greenwich Village. Rachel Brosnahan plays Mrs. Maisel “Midge,” who is running a tight domestic ship without skipping a beat (she even got the rabbi to come for a meal), that is, until Mr. Maisel (Michael Zegan) walks out on her, leaving her to discover a latent gift for comedy (a talent to which her sappy ex also aspires). Created by Amy Sherman-Palladino, whose trademark wit and sharp eye for setting wonderfully immerses viewers in this funny and charming yet also angst-y and involving dramedy. Brooklyn. 1 disc. color. 105 mins. John Crowley, 20th Century Fox. 2016. DVD UPC 024543213024. $7.99. DRAMA While not as risqué or a comedy at all, this adaptation of Colm Tóibín’s 1950s-set novel of the same name shares many similar elements with The Marvelous Mrs. Maisel, particularly in how it recalls a specific era through lavish detail and follows a the life of a young woman making her own way and choices. 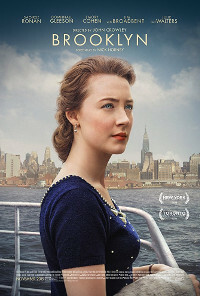 Eilis Lacey (Saoirse Ronan), forced by a lack of job prospects, leaves her family behind in a small town in Ireland and immigrates to Brooklyn, where she takes up residence in a boarding house, slowly makes friends, and painstakingly tries to secure a future for herself. Akin to Mrs. Maisel, the story features a sharp evocation of life working in a department store (in a particular area of New York), gorgeous costumes, and colors that pop. In a much quieter way, it mines experiences and feelings that Midge knows well. 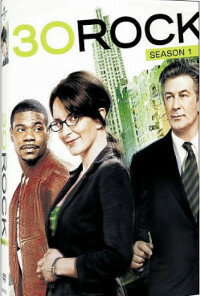 30 Rock: Season One. 3 discs. color. 457 mins. Universal. 2011. DVD UPC 025195007870. $29.99. COMEDY Tina Fey's send up and ode to variety TV and the office drama is powered by humor and smarts, notable for its cinematography, quick dialog, and fine sense of pacing. As with The Marvelous Mrs. Maisel, it takes place in New York City and is the embodiment of a culture and time. Fey plays Liz Lemon, the head writer of a comedy sketch show. Alec Baldwin fills the role of an alpha network executive, while Tracy Morgan and Jane Krakowski star as the show's leading talent. 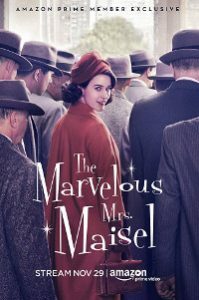 A critical success, with multiple Emmy Awards to its name, the plot follows the personal lives of the characters as well as the development of the show itself across seven seasons, sharing with Mrs. Maisel, rich humor and zany charm. 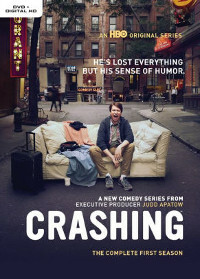 Crashing: The Complete First Season. 2 discs. color. 240 mins. 2017. DVD UPC 883929595884. $14.99. COMEDY This HBO series opens with a reverse of Mrs. Maisel. Pete (Pete Holmes), a striving and fairly clueless stand-up comic (who studied to be a youth pastor), discovers his wife is having an affair. When he unexpectedly gets a spot at a comedy club that same night, he bombs his performance. Things get worse from there, but Pete does pick up a mentor, of sorts. This contemporary show reveals the darker side of life on the comedy circuit and the drudgery, too, yet it is balanced by Pete’s goofy, earnest charm. Mired in a far less glamorous side of stand-up than Midge encounters (Pete is not killing it, to put it mildly), this might please viewers who enjoy learning more about comics honing their craft, as it is full of cameos by real-life comedians. 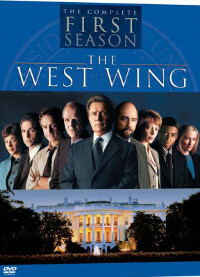 West Wing: The Complete Series Collection. 45 discs. color. 6,730 mins. Various, Warner. 2006. DVD UPC . $299.98. POLITICS/DRAMA For viewers seeking a more fast-talking show, Aaron Sorkin's political TV drama, set in the early 2000s, is essentially pure dialog, brimming with heart and affection for its characters. It follows an ensemble cast including the U.S. president (Martin Sheen), his family, staff, and colleagues (Allison Janney) and opponents on Capitol Hill. Over the course of seven years, the series held public service up as a higher good and explored the methods and meanings of politics—from making college affordable to the middle class to agonizing over issues of morals and choice. It also charts the experiences of women coming into their own and, like Mrs. Maisel, builds a community of characters with whom viewers want to spend time. 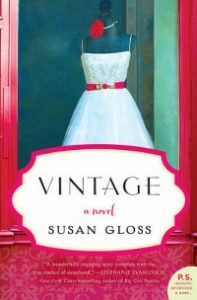 Vintage: A Novel by Susan Gloss. Morrow. 2014. ISBN 9780062270320. $25.99; ebk. ISBN 9780062270344. F The costumes of Mrs. Maisel are a big draw for many viewers, with Midge and her mother having closets to envy—including a striking black silk dress with bows, a richly pink wool swing coat paired with deeper pink gloves, and a jaunty suit with yet another bow. For anyone following the series for the fashion, there are plenty of books that will deepen the pleasures, such as Gloss’s heartening tale of three women trying to find their way. Each chapter in this warm-hearted novel is headed by a description of an item in the central character's vintage clothing shop, pulling readers deeper into the eclectic world of treasured dresses, shoes, hats, and more. 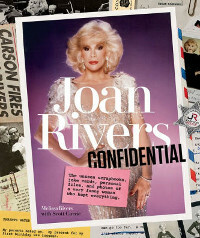 Joan Rivers Confidential: The Unseen Scrapbooks, Joke Cards, Personal Files, and Photos of a Very Funny Woman Who Kept Everything by Melissa Rivers with Scott Currie. Abrams. 2017. ISBN 9781419726736. $40; ebk. ISBN 9781683351320. BIOG Midge is modeled in part on Joan Rivers, one of the early pioneers of female stand-up comedy, who began making people laugh for a living in the 1950s. A noted collector of paper and ephemera, Rivers kept a variety of mementoes as well as thousands of jokes typed on index cards. After her death, Rivers's daughter gathered much of this material, as well as scripts, typed joke notes, letters, photos, and more, into a tribute to her mother's iconic life. Arranged by decade, this work pictorially tracks Rivers's career from its start on the stand-up circuit to her reinvention and revival in the 2000s, offering a reminder of the real-world setting of Midge's fictional life. 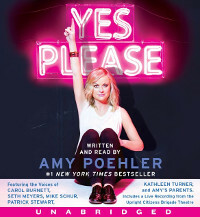 Yes Please by Amy Poehler. Read by the author. 7 CDs. 480 mins. HarperAudio. 2014. ISBN 9780062350886. $34.99. MEMOIR Saturday Night Live and Parks and Recreation alum Poehler writes a charming and funny memoir full of advice and stories of her work as a comic and writer. The print edition pleased critics and hit the best seller lists, but the audiobook is where it really shines. With her inviting, richly rounded voice, Poehler makes listeners feel like her new her best friend. Joining the author are Seth Meyers and Mike Schur, Poehler’s parents, Eileen and William, and Carol Burnett, Kathleen Turner, and Patrick Stewart, each of whom add to the hilarity and flair of the listening experience. 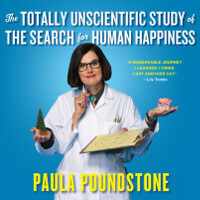 The Totally Unscientific Study of the Search for Human Happiness by Paula Poundstone. Read by the author. 6 CDs. 7 hrs. 30 mins. HighBridge Audio. 2017. ISBN 9781681684031. $34.99. MEMOIR This memoir from NPR’s Poundstone (Wait Wait ... Don't Tell Me!) draws on the author’s personal life for its humor, and as expected, it is laugh-out-loud funny. Perhaps unexpected is how heartfelt and serious it is, too. Poundstone’s unmistakable voice, with its lovely cadence and unique pitch, fills the narrative with inflection and punch. And as those who regularly listen to comic podcasts or recorded routines well know, there is a particular pleasure in long performances, as Poundstone proves in this grand and hilarious work.